Choppy bob hairstyles are trending this season with short and sizzling new recreations that have been experimented by a whole lot of women. Flaunt the perfect look with lots of shags and steps in your tresses once you style these beauties and make them a permanent part of your profile. Bring out the sassiness in you by showcasing your appearance with combinations of choppy bobs and decent accessories suitable for formal as well as informal occasions. This look not only gives you the season’s hip look, but it also brings out confidence in you that tends to make you stand out among the crowd. The following list of funky bob hairstyles will surely take your profile to a whole new level- nothing short of the definition of a true fashionista. Portray your carefree self with smooth fringes coupled with a short and straight bob, which is ideal when it comes to choppy bob hairstyles. The best part about this particular hairstyle is that it suits and complements every lady irrespective of her age. This look is on the go with neat edges that fall just at your chin, perfect for women with round faces as it covers the bulge. Stylize this choppy bob hairstyle with minimum maintenance and flaunt a long lasting look. A very chic way to flaunt the most attractive hairdo among choppy bob hairstyles is to add the spiciness of lowlights and highlight in your hair. Select such a color from the pallet of shades which when combined with the natural shade of your hair brings out the diva in you. 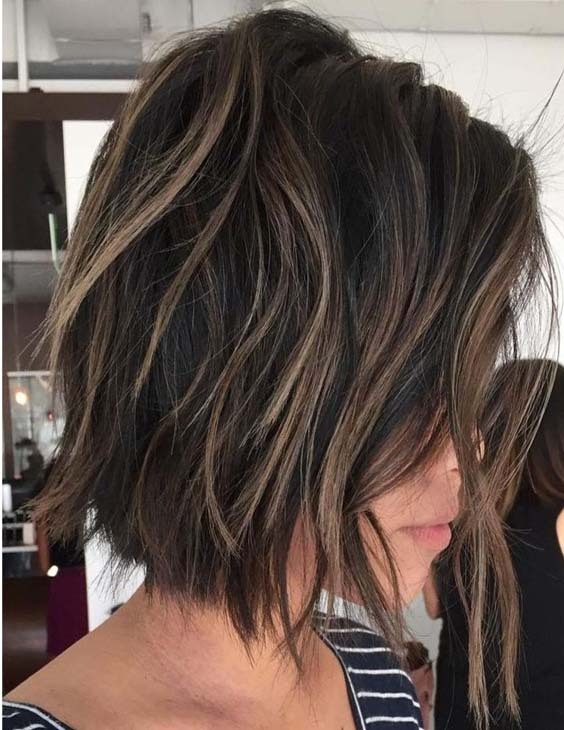 Chocolaty brown low lights are often adopted and fashioned with alluring choppy bob hairstyles, giving the darker layers of your tresses an extra dimension. Choppy layers will always prove to be engrossing and charismatic as the bounce of the hair become the center of attention. Adopt an enthralling texture in your hairdo as you feature your choppy bob hairstyle with straight edges and cuts. This irresistible cut guarantees the look of a rocker girl, which is much in fashion these days among teenage girls. The desirable angled bob with stacked layers among choppy bob hairstyles is a desirable hairdo in which the razor cut bangs fall right at the forehead and one end of the bob is longer than the other to engross the audience in the alterations of this angled bob. Fashion your tempting bob with the styling option of loose curls. These curls will remain intact for long due to the multiple layers in the hair crown, while giving your overall appearance a ten on ten on the fashion and trend scale. Ladies, make your way all the way to the top when it comes to flaunting and complementing your look with the most seductive and graceful selections among choppy bob hairstyles. The glamour and shine of these evergreen hairdos will never wear off as you seductively fashion them in several events.